What Is the Domino Theory in Regards to Communism? The Domino Theory was a metaphor for the spread of communism, as articulated by US President Dwight D. Eisenhower in an April 7, 1954 news conference. The United States had been rattled by the so-called "loss" of China to the communist side in 1949, as a result of Mao Zedong and the People's Liberation Army's triumph over Chiang Kai-shek's Nationalists in the Chinese Civil War. This followed close after the establishment of the communist state of North Korea in 1948, which resulted in the Korean War (1950-1953). In the news conference, Eisenhower expressed concern that communism could spread across Asia and even toward Australia and New Zealand. 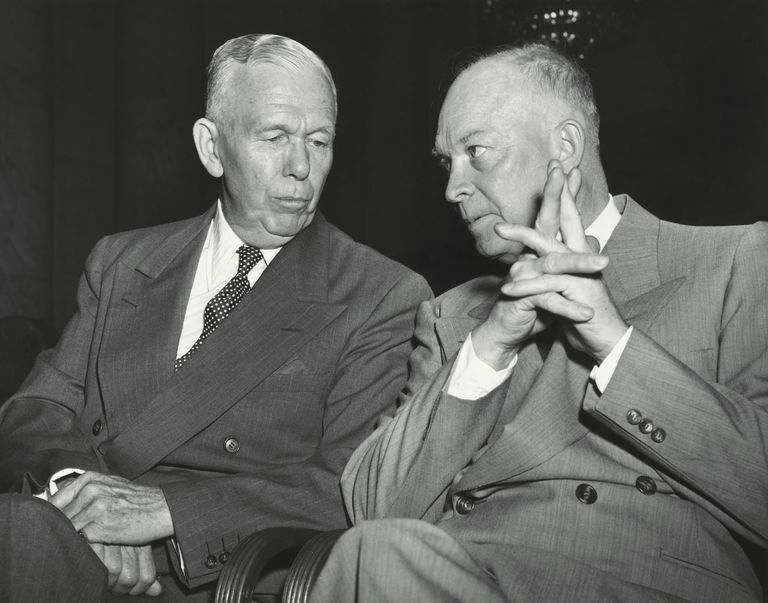 As Eisenhower explained, once the first domino fell (meaning China), "What will happen to the last one is the certainty that it will go over very quickly...Asia, after all, has already lost some 450 million of its peoples to the Communist dictatorship, and we simply can't afford greater losses." Eisenhower fretted that Communism would inevitably spread to Thailand and the rest of Southeast Asia if it got past "the so-called island defensive chain of Japan, Formosa (Taiwan), of the Philippines and to the southward." He then mentioned the supposed threat to Australia and New Zealand. In the event, none of the "island defensive chain" became communist, but parts of Southeast Asia did. With their economies ravaged by decades of European imperial exploitation, and with cultures that placed higher value on societal stability and prosperity over individual striving, the leaders of countries such as Vietnam, Cambodia, and Laos viewed communism as a potentially viable way to re-establish their countries as independent nations. Eisenhower and later American leaders, including Richard Nixon, used this theory to justify US intervention in Southeast Asia, including escalation of the Vietnam War. Although the anti-communist South Vietnamese and their American allies lost the Vietnam War to the communist forces of the North Vietnamese army and the Viet Cong, the falling dominoes stopped after Cambodia and Laos. Australia and New Zealand never considered becoming communist states. In summary, the Domino Theory is basically a contagion theory of political ideology. It rests on the assumption that countries turn to communism because they "catch" it from a neighboring country as if it were a virus. In some sense, that can happen -- a state that is already communist may support a communist insurgency across the border in a neighboring state. In more extreme cases, such as the Korean War, a communist country may actively invade a capitalist neighbor in hopes of conquering it and adding it to the communist fold. However, the Domino Theory seems to posit the belief that simply being next to a communist country makes it "inevitable" that a given nation will become infected with communism. Perhaps this is why Eisenhower believed that island nations would be relatively more able to hold the line against Marxist/Leninist or Maoist ideas. However, this is a very simplistic view of how nations adopt new ideologies. If communism spreads like the common cold, by this theory Cuba should have managed to steer clear. What Were the Geneva Accords of 1954?